APANAMA: DPM says NO LABU! DPM says 'No LCCT in Labu". PHUKET, Feb 22 (Bernama) -- The government is firm in its decision to reject the plan by AirAsia Bhd and Sime Darby to build a RM1.6 billion low-cost carrier terminal (LCCT) Labu, Negeri Sembilan, Deputy Prime Minister Datuk Seri Najib Tun Razak said today. He said the project cannot be continued according to the original plan as Sime Darby would not pay the RM800 million infrastructure construction cost. "They will only sell the land to the party that is building the infrastructures. If Airport Malaysia (Malaysia Airports Holdings Bhd (MAHB), it means sell to Airports Malaysia...they (Sime Darby) will not pay for the RM800 million infrastructure cost," he told Malaysian journalists covering the Special Asean+3 Finance Ministers' Meeting in this tourist resort here Sunday. 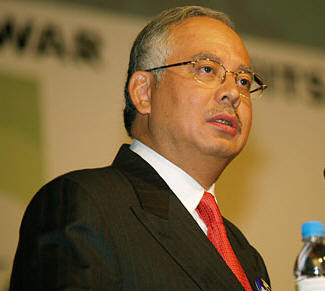 Najib, who is also Finance Minister said he had received confirmation in "black and white" from Sime Darby on the matter. "If they (Sime Darby) did not contribute, there is no basis for the project to be considered," he said. Najib said this when asked to comment on reports that the plan to build a LCCT in Labu is still being discussed between the government the parties involved. p/s Hopefully this no-nonsense statement from the DPM would stop any further arm-twisting or scare tactics from Tony and his buddies. Just get ready to retire brothers, your time is up. Tony Labu and buddies will not give up. They will be up to some more tricks. Or until Najib take over as PM.